Visit oBedding online at oBedding.com for everything you need to give kids a bedroom of their dreams. oBedding has a huge selection of girls and boys bedding sets, wall accents and coordinating room decor, you are sure to find what you want for girls and boys from toddlers to teenagers. oBedding's popular brands include officially licensed merchandise from Disney, Nickelodeon, Olive Kids, Dan River and more. Save on your next purchase from oBedding.com with oBedding discounts, oBedding coupons and oBedding savings found here on 58Coupons.com. When you purchase $25 or more you will receive free shipping from oBedding.com. Click code to start shopping now. Hurry and save 11% on any online order at oBedding.com. Click code to get started. oBedding.com is giving away a Free HP Disney Card Set valued at $29.99 on orders over $75 or more. Click link to view. Save 11% on all girls bedding & room decor at oBedding when you use this coupon code. Click link now. Enjoy an 11% discount on all boys bedding & room decor at oBedding.com. Click code to view. 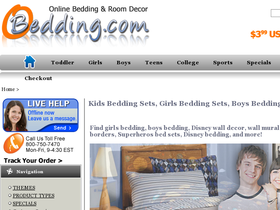 No matter how big your order is oBedding.com is offering flat rate shipping of only $3.99. Click code to start shopping.